Acquired: 2014, EBay. TTM 2015, C/o Home. Well Erroll has been difficult for me to track down and since I had 2 failures, I thought I might as well acquire at least one autograph of him on the cheap through EBay. Anyway, I wasn’t too happy with this seller. After I scanned in the card, and added it into the WLAF book of autographs, I noticed something when it was lined up next to its sister cards: it had been trimmed. Also called shaving, trimming is a frowned upon practice that has gained notoriety as of late because of media attention after a Honus Wagner had its edges removed just ever so slightly to increase the value of the card. In this case a full 2 cm had been removed from the bottom of the card, and as I had doubles of Tucker’s card I could easily see that the height wasn’t consistent with the other cards. Such a pain as I still needed another autograph of him on his ProSet WLAF League Leader card. I decided to give Tucker a final shot in 2015, and it appears my persistence paid off as not only did I get Erroll on another base card to replace the Ebay card, but also I got him on his league leader card. A return specialist and speed merchant at Utah, Erroll Tucker led the nation in kick return (29.1) and punt return (24.3) averages in 1985. He was drafted in the 5th round by the Pittsburgh Steelers but did not see any playing time his rookie season. Tucker returned to the NFL in 1988 playing for the Bills (1988-1989) and Patriots (1989). 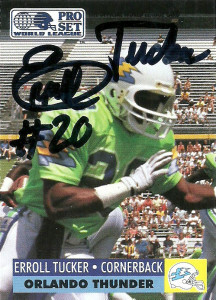 Tucker was selected by the Orlando Thunder with the 8th overall pick in the defensive back portion of the WLAF draft in 1991. His 4.6 speed and previous NFL experience fit in well with Don Matthews man to man defense scheme. 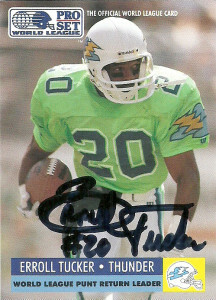 Erroll made 2 interceptions in the league’s inaugural season but he was more dangerous on special teams returning 7 kickoffs for 257 yards and a 95 yard TD, in limited duty behind Carl Painter. On punt returns Tucker was equally dangerous returning 18 punts for 373 yards and a 66 yard TD. He earned All-World Honors after the season. Tucker decided to keep playing and went right over to the CFL signing with the Calgary Stampeders. After winning the 80th Grey Cup, Tucker decided to retire. He’s been involved with coaching at the college level and currently lives in California.